Here’s the situation: You need your child to do something important — finish her homework, clean his room, get dressed, mow the lawn, write thank-you notes, lie down for bed, whatever. You kindly ask your child to help out, and you get a strong “No” or “Not right now.” You wonder: How am I ever going to get my child to do this? And then the negotiation begins. Does the this scenario hit home? Perhaps it hits home a bit too well…! You: Time to brush teeth! Child: No way. I don’t need to brush my teeth! You: Yes, you do. It’s part of keeping healthy so your teeth don’t fall out! Child: I don’t care if my teeth fall out…! I don’t need teeth! Sometimes you just need to win these negotiations. It’s nothing personal, but kids often don’t want to do some of the basic things that they need to do to be happy, healthy, and emotionally well-adjusted. Baffling, I know, but the reality. In these situations, I negotiate to win. I’m trying to get them to brush their teeth or complete whatever activity I need while using as little Dad capital as possible. And I use the negotiation tactics described here. First, one comment: I get that we’re not always trying to “win” negotiations with our children. We’re not making million-dollar deals here, we’re raising well-adjusted human beings (in theory). 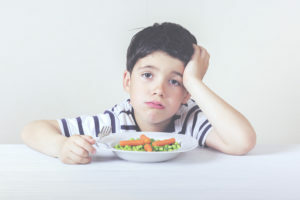 But sometimes, if my kid isn’t self-motivated to eat a good dinner, take a bath, get to bed, or complete whatever other task is needed, it just won’t happen. So I negotiate. Because if I lose, they won’t be dressed / bathed / whatever that, in the longer run, makes me a worse parent. For all the times when you don’t need to negotiate, feel free to disregard this advice and love your kids as much as they’ll let you. But for times when you need a win, here are some tools for your arsenal. Let’s begin! Fair warning: This is a long post!! They make demands that defy basic common sense. They ignore your logic and reason, no matter how brilliant you are. They are emotional, radical, and trigger-happy. They have goals and objectives that you have no ability to meet. They have highly-specific but continuously changing preferences. They are willing to destroy the both of you if they have to. They have an endless well of time and energy to devote to the negotiation. How do you negotiate with a terrorist? Well, just like one negotiates with everyone: figure out what each of you is trying to achieve, and find a solution that meets those needs. While it sometimes may make sense not to negotiate with terrorists — i.e., I wouldn’t recommend negotiating whether to look both ways before crossing the street — there are many instances where negotiating with your child to get a mutually agreeable outcome fosters discussion, agreement, and critical thinking. Knowing the basic economics and emotions of negotiating will help you win the next time you need to negotiate with your child. Or at least not lose your shirt. You aren’t negotiating so that your kids “lose”. Rather, you’re negotiating for a win-win that works for everyone. The biggest wins occur when both of you have a smile on your face at the end. The first thing you need to know is the concept of BATNA, or the Best Alternative To a Negotiated Agreement. In a negotiation, your BATNA defines your walk-away point — that is, what is your alternative to reaching a negotiation with your counterparty? While you both may prefer to reach an agreement, each party has an idea of how they would proceed if no agreement is reached — their best alternatives influence how strongly they are motivated to reach an agreement, and what kind of agreement range is economically beneficial for them. The reason you negotiate is to produce something better than the results you can obtain without negotiating. What are those results? What is that alternative? What is your BATNA — your Best Alternative To a Negotiated Agreement? That is the standard against which any proposed agreement should be measured. That is the only standard that you can protect you both from accepting terms that are too unfavorable and from rejecting terms it would be in your interest to accept. Source: Getting to Yes: Negotiating Agreement Without Giving In, by Roger Fisher and William Ury, Penguin Books, New York: 1981, 1991, 2011, Chapter 6. Want to see an example? See the Appendix example on Negotiating to Buy a House. Okay, enough theory! Let’s dig into practical applications of negotiating with your terrorist — oops, I mean your child. Let’s translate this into negotiations with your children. 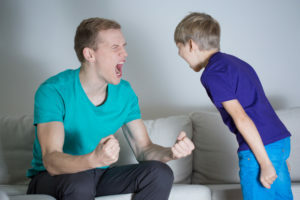 The first step in successfully negotiating with your child is evaluating your child’s BATNA — what is his or her walk-away point if they don’t agree to do what I need them to do? Here’s the situation: You need your child to do something — finish his homework, clean her room, get dressed, mow the lawn, write thank-you notes, lie down for bed, whatever. You kindly ask your child to comply, and you get a strong “No” or “Not right now.” You wonder: How am I ever going to get my child to do X? And so the negotiation begins. You start by being more stern: If I just tell them that I *really need* them to do X, they’ll do it, right? Yeah, right. If your kids are anything like mine, that strategy works, like, once in a thousand times. So you try to figure out what they want and what they need, and ultimately what might motivate them to complete the desired task. If you do X, I’ll read you a book. If you do X, I’ll give you a check mark / sticker / points towards a prize. If you do X, we can do Y later. Before you know it, you’re negotiating a complex corporate contract for what you’ll contribute if they do what you need them to do. You: Would you mind eating your chicken and pasta, please? Child: No — I don’t like chicken and pasta. You: Well, that’s what’s for dinner. You need to eat it if you want dessert. Child: I don’t care. I’m not eating it. Child: Fine, I’ll eat. How about half a plate? You: That works for me — thank you! You: Are you going to eat? Child: No, I don’t like this food — it’s disgusting. You: Well, you have to eat something. You: Fine, what do you want? Child (silently): I win! Parents are so easy to manipulate! So what’s a parent to do? You can’t just let your Spirited Child / Selective Eater / Strong-Willed Off-Spring run (ruin?) your life, can you? One strategy is to capture a BATNA change. You’re waiting for that little hint, that small admission or acknowledgement, that they need something, that totally changes the negotiation landscape. Child: Can I play outside after dinner? You: You can play outside later if you eat a few bites of chicken and pasta. Child: What? That’s not fair! Child: Fine, I’ll take a few bites. You (silently): Victorious! I’ve outsmarted a 5-year old! You (out loud): Thank you, I appreciate it. You’re not being cruel, you’re just using their emotions and framing of the situation, combining those with some tactical negotiations, to get a more healthy dinner. You’re channeling your child’s top-of-mind desire into other positive behaviors. Me: Kids — did you hear what I just said? It’s time for school. Kids? Child: Dad, can I pick out a story to listen to on the way to school? Me (silently): Ah ha! Gotcha! Me (out loud): Yes, of course. If you go get in the car, you can pick something out. Successful negotiation at it best! Child: How much chicken do I have to eat to get ice cream? This classic parenting move — offering a reward for desired behavior (a.k.a. bribing) — will be unrecognized by only the most rookie parents. Most parents use this kind of strategy all the time. But conceptualizing this into a BATNA / negotiation framework helps you figure out strategies to change your child’s walk-away point. If you child’s BATNA is a state that will defeat you or drive you crazy, don’t flip out or be frustrated by their position. Simply think how you might change their frame of reference as to what is at stake. Here, it’s not chicken and pasta at stake, it’s ice cream. Here’s another example: you’re reading books to your kids before bedtime, and you know that when this book is done the conversation will devolve into “One more book!” syndrome. Once “One more book!” syndrome ensues, I almost always end up reading more, whether I want to or not. So, what I try to do, is to get their agreement on how many books we will read before the book reading begins. In other words, get them to commit to 2 books up front, while their BATNA is weak — if they don’t agree, they don’t get any books. This is a waaaaay better strategy than trying to deal with their book requests after 1 or 2 books have been completed. Even better, stop the book in the middle, while their BATNA is that they won’t hear the rest, and get them to confirm that we’re laying down as soon as this book is done. Corollary: If you need your child to get dressed, brush teeth, and lie down before bed, don’t read them books before they do those things! Reading books is a joyous time for the both of you, but it’s also your best leverage to get them to take care of the other essential steps before bedtime. Instead of giving it freely, use one-on-one book time as the motivation for taking care of other chores first. Pro tip: promise them extra book time if they get ready promptly (but be willing to stick to your guns of not adding extra time if they don’t cooperate!). Second pro tip: get them to commit to turning the lights out *in the middle* of a book: “After we finish this book, we’re going to turn out the light and lay down, right?” I’ve never had a kid say no to that question if we’re in the middle of a book. There’s nothing evil or misguided about this. After all, you’re just trying to come to a mutually acceptable agreement. Up until now, we’ve been focusing on your child’s BATNA. But what about your own BATNA? Your BATNA, or your willingness to hold firm in a situation, has a big impact on a negotiation outcome. 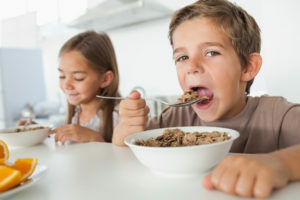 If you’re concerned about your child’s health or mood if they don’t eat, then you’re going to give in quickly and agree to something more favorable for your child to eat. On the other hand, if you’re comfortable and confident that they’ll eat eventually, you’re more likely to hold firm and have dinner closer to your ideal outcome. Often, the success of my own negotiations with my kids around bedtime come down to a single factor: how busy I am with work and whether I intend to go back to work after they go to bed. If I’m feeling stressed and want to get back to my computer, my kids will sense my weak BATNA and will take advantage of me. They’ll end up getting more books (not all bad! ), staying up later, and possibly even getting a snack. That kind of thing never happens when I have a strong BATNA — i.e., when I’m willing to wait out the tantrum because I don’t have a pending report to write. My amount of stress and yelling is directly proportional to the amount of work I have left to do after they go to bed. When the workload is zero, my stress and yelling are usually pretty close to zero too. Corollary: Try to wrap up your work before your kids’ bedtime routine. It’s better to work an extra hour earlier and be done by nighttime, then to have an hour or two of work after the kids go to bed. If you’re already mentally signed off of work for the day, your bedtime routine will be much, much improved. As you probably know, establishing a strong BATNA depends on your reputation for holding strong in the past. If you’ve given in quickly the previous three nights, you’re more likely to be taken advantage of the next time around. My children are like Jedi Knights when it comes to sensing my tendency to give in. Consider this aspect of the dynamic: you’re middle-aged, you have several kids, you have a career, bills, and many demands on your time. You’ll do almost anything to reduce conflict and make sure home interactions go smoothly. By complete contrast, your kids can pretty much devote 100% of their time and energy to getting what they want. They don’t have to log extra hours of work. They don’t have to pay the bills. They just want dessert, and they’ll do whatever it takes to get it. They’re mental terrorists, basically, with all the time in the world to undermining your position. The key to successful negotiation with your kids is to match your actual BATNA and your communicated BATNA as closely as possible in repeated interactions. If you say that you’re willing to give them no dessert, you better mean it. If you threaten to take away their favorite stuffed animal, you’d better follow through. Because the next time you communicate your BATNA, they’ll remember whether you held up. You can stretch your communicated BATNA every once in a while — if you don’t clean your room, I’m going to throw out all of these toys! — but you’re generally better off if you accurately communicate your walk-away point that you’re willing to enforce. 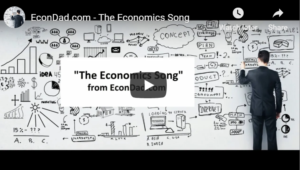 Even economists (really!) recognize that negotiation is more than just cold, rational calculations. Emotion and relationships matter too. “I switched to my ‘Late-Night, FM DJ Voice: deep, soft, slow, and reassuring.”… This soothing voice was key to easing the confrontation… The best way to describe the late-night FM DJ’s voice is as the voice of calm and reason. Never Split the Difference: Negotiating As If Your Life Depends On It, by Chris Voss, 2016, HarperCollins Books, New York. You: Your room is filthy, can you clean it? Child: I’m not cleaning. It’s my room, and I don’t have to. Child: How about if I clean it later this afternoon? Here, you’re using the powers of psychology and interpersonal relationships to help your child find the negotiation solution on their own. Less work, better outcome, love it! Kids are very sensitive to which parents enforce which rules. They know who’s the softy on bedtime, and who will let them eat extra dessert. Their brains map this stuff out like a detailed catalog of infinite information. You’re way better off allowing your partner to complete the negotiation. If a kid comes to you to try to get you to be the good cop, simply say: “Well, this is your Mom’s issue” or “Your Dad is handling this” so that your partner can keep firm where they want to stay firm and give in where they want to. It’s crucial for maintaining reputation. Good cop / bad cop might work well for criminals, who don’t have the same negotiation every day in a row. But for parents and kids, who negotiate the same things day after day, it’s a terrible strategy. Remember, we’re not trying to have *parents win* and *kids lose*. That misses the point. But practically speaking, there are times when we need our kids to do the things that they won’t otherwise do by themselves. We need strategies that produce effective behavior. Knowing your BATNA, your child’s BATNA, and the negotiation strategies around those BATNAs provide a great starting point for persuading your child to a mutually agreeable deal. After all, who says you shouldn’t negotiate with terrorists? You’re willing to buy the home for $400,000 or less, and the seller is willing to sell it for $375,000 or greater. So you should be able to come to an agreement. Any point within this range is a plausible and, to some degree, acceptable outcome of the negotiation. The trick is that neither you nor the seller know each other’s BATNAs. 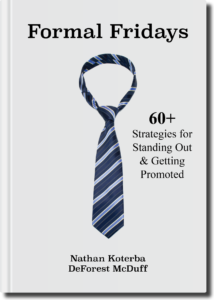 The position of your BATNA and your ability to communicate a strong BATNA influences how good of a deal you can reach. If the other side senses that you benefit a lot from the deal or have a low outside option, they can negotiate harder over the economic surplus. If the other side senses that you have good outside options and don’t need the deal, you can usually secure a better price. Understanding where you stand and where the negotiating party stands in terms of best alternatives is key to a good outcome.